“Tree topping”, or the practice of removing whole tops of trees or large branches and/or trunks from the tops trees, is not something we recommend. In the long term, it can be detrimental to a tree’s health and often leads to other problems which will then need to be dealt with. It may even lead to the loss and subsequent need for removal of the tree. Why is topping bad for trees? As bad as topping is for a tree, we don’t absolutely refuse to do it. However, we are happy to offer better options that accomplish the same goal. Often we’re able to show our customers different ways that they can achieve the results they want. In the end, if you are determined to top your tree, we will work with you to get the job done. If you are interested in scheduling an appointment for tree topping or just want to learn more about it, give us a call today at (540) 886-5577. Use the form below to request a free estimate on your Tree Topping needs in the Staunton, VA area. Another reason that a lot of people get their trees topped is because the tops of our trees can really start to get in the way of your view, they can start touching power lines, and they can just cause problems. Tree topping helps keep your tree at the size that you need it to be, for whatever reason. When your tree gets topped, we cut off the uppermost branches that aren’t all that strong, or ones that aren’t pulling their weight. We can also trim down the size of larger branches if height is your issue. Tree topping isn’t as easy as it looks, which means that we do need to do a bit of investigation into your tree to really get a good as to how much to charge you for our services. However, we are able to give you an estimate that is accurate. Some of the things we will look at include type of tree, where the tree is located, and how much topping we will have to do. Call us today, and we will be able to give you a more accurate estimate. You have to be careful when you hire a tree service to top your trees, so we suggest using this guide when hiring one. 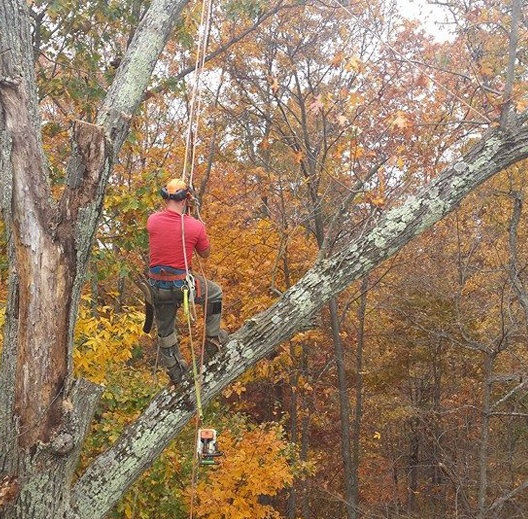 We are proud to say that Staunton Tree Service upholds all of those standards and more.